Uh, what's this page about? OK, a little bit of history...each single computer that is connected to the internet (like yours, like this server here) needs an unique Internet address, so called IP-address to make things working. The grand-dads of the Internet created a space of more than 4 billion available addresses, and this is called Internet Protocol version 4, a.k.a. IPv4. However, when this new thing called Internet kicked off, some ignorants (HP, Level 3, Apple, AT&T, Haliburton and many more) claimed big parts of this address space for theirselves. The registries run out of Internet addresses, and therefore no new computers can join us here in the Internet anymore (in parts of the world). A "few years ago" the responsible task forces acknowledged the problem, and created a much bigger space of new internet addresses - it contains 3.4×10^38 addresses...round about 7.9×10^28 IPv4 internets, and therefore plenty of space. They called it IPv6. This became public in 1998! Pretty much 20 years later most of the traffic in the Internet is still using IPv4...because a good number of the Internet Access Providers are too lazy for several reasons to introduce IPv6 to their audience, you! Now, this is not because the would have to buy new technology, the common hardware is IPv6-ready since years. And it is not due the lack of knowledge, the know-how is there, and it is well documented. The real reason (in most cases!) 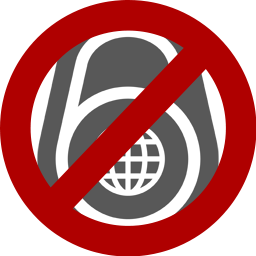 is: IPv6 solves problems the classic Internet Access Provider doesn't have. "So who pays the bill?" Easy to answer: Companies in countries outside North Amerika and Europe so. They started to join us here in the internet, but they cannot get enough address space for IPv4. Means, they cannot offer services as they like. Isn't it great for the big companies not having to worry about competition? OK, it is a little bit unfair, since all big gameplayers are IPv6 ready. However, you will get the implications! "Who else pays this bill?" We do! Right now you are probably connected using several devices to your Internet router, your computer, smartphone, maybe smart-tv and many more. With IPv4 they hide in a so called private address space, and the router receives that ONE public address from your provider. Each single request becomes a translated one (just google "NAT"), and there is no "direct routing". This makes the technology complicated, the support as well. "OK, just use IPv6 then!" I do, already. However, more than the half of my clients (a.k.a you guys) are using IPv4 only. If I decide to use IPv6 only, to avoid costs for additional IPv4 addresses, I would cut off more than the half of my clients from playing this game. I'm still supposed to run IPv6 only? "Ok, but why are you telling me?" Check the picture below. You are coming along using IPv4, your provider seems to be one of the lazy ones! Maybe you contact the support guys of him, and ask them if you can expect them to switch on a technology which is around 20 years old...Thanks for doing so!